The gravel drive was long and winding, beautifully lined with evergreen trees about eight to nine feet tall, perfectly spaced and nicely trimmed. The lush, green lawn was well-manicured as was the shrubbery buttressing the front of the completely ranch-style mansion. It was the old Caring Ranch, the childhood home of Grace and Suĳnwe, her adopted brother. This is where they had lived most of their lives until each went away to pursue further education. When their parents died, of course, they bequeathed the home and property, about 10 acres, to their two children. Grace and Suĳnwe had always been very close, and they’d always dreamed of growing up and somehow working together. In fact, most of the childhood games they played had them teamed up together to fight crime, solve some mystery, save the earth from destruction or whatnot. They were truly like “two peas in a pod.” Of course, neither one of them considered selling Caring Ranch; instead, they decided to make it both home and hub. Grace had just recently passed the bar exam, and Suĳnwe had only just earned his Master’s in Social Science at the time. Grieving the loss of their parents, whom they both loved without reservation, they nevertheless talked excitedly about their plans for an investigative, communally-minded law firm. The name came easily. Both Grace and Suĳnwe had always been fascinated by the Phoenix. The mythical creature conveyed powerful hope as it rose from the ashes; even more, eternal hope in nothing less than resurrection from the dead. 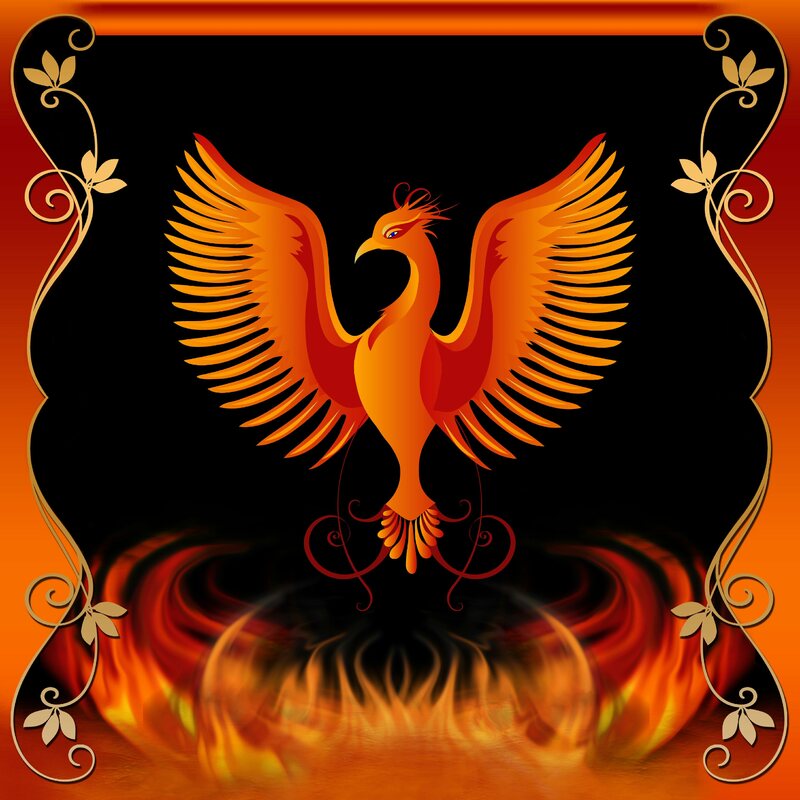 The Phoenix rebelled against human reasoning, defied the naturally possible, and cried against the inevitable end of life. Thus, Phoenix Rising was born. Dr. Wiseman, the strikingly handsome 48-year-old, well-respected psychologist from Grand Oak, made her way slowly up the drive, breathing in once again the magnificently crisp, cool, fresh air that always seemed to permeate this place. She glanced over at Morris who, though obviously tired, seemed somehow at peace. This place – Caring Ranch – has a way of doing in minutes what a dozen priests and an army of psychologists could not do in months! I’m not surprised… Not at all surprised. Thank God, then! Maybe he’ll feel perfectly comfortable just opening up to Grace and Suĳnwe… Then again, that may be hoping for too much! It only made sense for Dr. Wiseman to pick up Morris and bring him to Phoenix Rising. Lucent had to work, Able and Moxie had classes, Blue was at Lucent’s home “holding down the fort” and awaiting phone calls and further instructions. The boys, thankfully, actually wanted to go to school, most probably as a much-needed break from all the trauma! Joy was in the hospital, of course, and Effete was out and about taking care of business … business of the most important kind. This left Dr. Wiseman, who was well-acquainted with Phoenix Rising anyway, to convey Morris to Caring Ranch and make the friendly introductions. Morris’ mother would not be visiting today; she was at the Hart Community Clinic now being further examined and treated by Lucent, at least as best as possible given the fact that Angelica did not want doctors involved. Sage Wiseman pulled her car to a stop next to two other cars parked out front. Evidently, the whole team was here … at least somewhere in the mansion compound. She opened her door and stepped out. Morris followed suit. The magnificent home, beautiful as it was, stood so strongly and boldly, it was just a bit intimidating. Even after her many visits, Sage found her first few steps up onto the porch somewhat difficult. She heard the guard dogs, all three German Shepherds, properly restrained but somewhere nearby. Chills ran up her spine, but she managed some comforting words for Morris. “Comforting,” Morris answered with a mock smile. Morris listened to the ongoing, informative conversation, but he was overwhelmed by the sheer beauty of the place. He was surrounded by white walls that looked like brilliant marble. Just inside the foyer, or short hallway, there were two plants at each corner. To his left and right were two nicely framed pictures, each with a votive candle about two feet beneath, resting atop a slender candle-holder. The first picture to his immediate left was one of the Dr. Martin Luther King, Jr. Next to him was another photo of the Blessed Mother Teresa of Calcutta, and just opposite the founder of the Sisters of Mercy was Mohandas Gandhi. Finally, to his immediate right, next to Gandhi, was Amy Wilson Carmichael. Interesting, he thought. Good choices, but interesting. And what of Grace? She almost looks as Indian as her brother? “Yes, the primordial version of the Pontifex Maximus,” Sage interjected. Morris followed like a puppy, but a puppy well aware of how he must appear to Grace, and the others, right now. He kept his head down; his cheeks were flush, and he suddenly felt dirty in their presence, particularly in the presence of this earthbound angel. Morris felt like filth was clinging to his body and soul, and he couldn’t get the sounds and images out of his mind. Suddenly, he felt (yet again) like dying. Wouldn’t it ultimately be better if he were dead? But, then, what about his mother? No, somehow he had to stay alive long enough to make sure she was o.k. Not surprisingly, Angelica felt exactly the same way. They entered a comfortably, delicately ornamented sitting room with just the slightest hint of incense floating through the air. Morris took his seat in a large, plush recliner while the others sat down as well, all in a non-threatening circle. Grace and Suĳnwe purposely sat on each side of Morris, with Dr. Wiseman directly across from him. This is so interesting yet at the same time awful to read. I hope it works out ok for Morris and his mom. It reflects so much of my own feelings of being lost it is really quite hard to read, but I am fascinated. Thank you once again, my friend and sister! Your encouragement continues to inspire me, and I do fully believe all will turn out well for Morris and his mother … and Effete!